Price: This event is 100% free so everyone will be able to enjoy some Christmas magic. Description: With the help of Santa’s elves, we’re inviting children to write their Christmas wish list and post their letters through a magical post box and watch as it travels all the way to Santa in Lapland – we reckon it will be the perfect place to make some special memories this Christmas. You’ll even get a reply! The post office will be open from 11.30am – 4.00pm every weekend up until Christmas. Description: It’s back! Santa’s Grotto 2016! We are delighted that Santa Claus will once again be joining us at Trump International in his beautiful Grotto! Mr Claus will be available to meet Children and grant their Christmas wishes. Maximum of three children per visit. Due to the cosy nature of our Grotto, space for adults is limited therefore if you could please ensure that you have a maximum of three adults during your visit it will ensure there is plenty of space for everyone! Our Clubhouse Restaurant will be open to serve fabulous lunches and dinners with great options for children. We strongly advise booking your table in advance to avoid disappointment. Price: Tickets £4.50 for all – big or small! Description: Ever wondered how Santa can deliver billions of presents to the whole world in just one night? Well we are here to help! Find out more about the science of Santa in a fun and fascinating show from Dr Sharon George of Keele University. Then sit back, relax and enjoy animated comedy Arthur Christmas on the big screen.You can even take home some Christmas crafts too! This special, festive family event is the latest instalment of Aberdeen’s Sci-Screen series, brought to you by the British Science Association Branch in Aberdeen and supported by the Big Lottery Fund. Santa’s Arriving at Stonehaven Harbour! Description: HO! HO! HO! Come along to Stonehaven Harbour on Saturday 17th December and see Santa arriving by the RNLI LIfe Boat! There’s festive drinks and mince pies in aid of the RNLI at The Granary Garage, on the harbour front, from 12:30pm. Meet Chase and Marshall from Paw Patrol, then see Santa speed into the harbour at 1pm. Follow his festive road train procession up through the town where you can meet him in his Paw Patrol themed grotto at Charles Michies, 24 Market Sq, Stonehaven. Santa will also be back in his grotto at Charles Michies, Stonehaven, on Saturday 24th December from 1.00 – 4.00 pm. Price: Tickets are £12.95 per child and include two free adults as well as a present for every participating child! Description: Join us for some festive fun at our Christmas Party on 17 December! Participate in Christmas-themed science activities shows, and party games, as we explore science in a festive way! The Christmas Party will take place from 1pm to 4pm on the 17 December and is recommended for children aged 7 and under. Description: The Linx Ice Arena is proud to present our 2016 ice show, Once Upon a Christmas featuring skaters from all levels and ages in our exciting and fun Christmas performance. Performances featuring home grown skaters from the Linx ice arena in a show to entertain the whole family! Description: Part of the Aberdeen winter festival. Joined by the capriccio choir from Albyn school. Come and join us for festive music and Christmas carol singing. Two “sittings” 11:00am – 12:00pm, and 2:00pm – 3:00pm. Price: £7 per child for 2 hours play including gift from Santa. Must be booked and paid for in advance. Description: Give the kids a special memory of an evening with Santa! At just £9.50 per child, come along for fun & games and a children’s buffet meal. Description: It’s £8.99 deposit including meals, games, meet santa and present from santa. The can book by coming in or call us on 01224 783 856 Santa is coming to the mains and it’s not to be missed! Description: Come and visit Santa in his grotto, his reindeer will be outside while you visit so remember to pop past and meet them too! There will also be our annual craft fayre where you will be able to pick up any last minute gifts. Price: Tickets £7.50 for children, include breakfast and a gift. Adults free entry, refreshments will be available to buy. Description: Santa will be taking a break from his busy schedule to come have breakfast at Culter Village Hall. Tickets must be purchased in advance so Santa will know who’s coming! 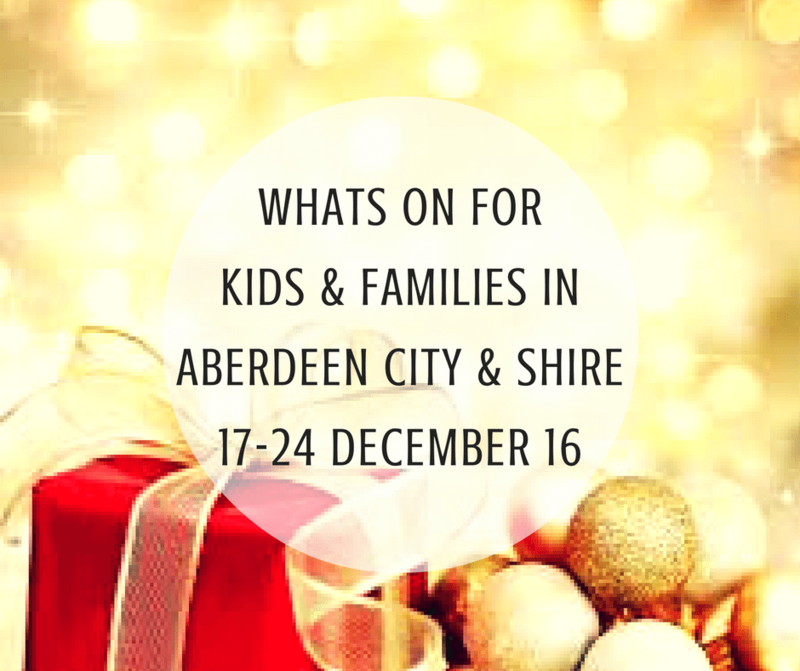 Description: As part of Aberdeen’s Winter Festival 2016 we will be having a Friends of Hazlehead Winter Wonderland in the park on Sunday 18th December! and of course there will also be: • Craft Stalls • Mince Pies • Santa Hats • Face Painting. Spread the word and come and join us! Price: £5 per person, under 12s free. Description: Escape the Christmas chaos and join us for a wintery wander around the park. We’ll see loads of ducks and geese on the lake, look for some late fungi and learn to identify trees in winter. Mostly on level, surfaced tracks with some walking in the woods while looking for squirrels. We will be walking for the full 2 hours and may have to stop and stand very quietly for some time while looking for squirrels. Description: Christmas Shopping Market, Local Traders and Makers. Onsite Cafe with Coffees, Cakes and Carvery! Description: A festive buffet lunch for all of the family with a gift from Santa for the children. Price: £5, Call reception on 01224 438900 to book. Description: Ho Ho Ho! Celebrate Christmas with our festive parties! Inflatable fun, games and sensory activities. Children under 5 will receive a visit from Santa’s helper and a gift!